Raja… you are now part of a happy family! 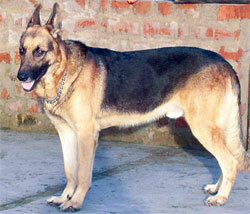 Raja, my GSD, is today a healthy, active, playful and obedient pet. But, he was not so one year before. One day, I got a message from my friend, who is also a canine trainer that Raja, a German Shepherd, is abused and tortured by his pet parents. They are planning to abandon him. I instantly took out my car and reached their place. His pet parents were happy to know that we have come to take Raja away…probably they just wanted to get rid of him! The sight of Raja was heartening…he looked sick and was obviously suffering from several injuries and diseases. He had scanty fur and his nails were very long due to carelessness. But he was active and happy to go out. I brought Raja home to my three pets – one German Shepherd girl and two German Spitz girls. I took him to the vet and Raja got proper treatment for tick fever and other ailments. Today, he is a strong and active canine…but he still faces problems in adjusting with other pets and people…maybe his previous wounds have still not healed! Nevertheless, Raja has emerged as a true winner and a happy family member! http://www.dogsandpupsmagazine.com/wp-content/uploads/2009/05/raja1.jpg 134 250 Dogs and pups Magazine http://www.dogsandpupsmagazine.com/wp-content/uploads/2017/05/1254nal.jpg Dogs and pups Magazine2009-05-14 00:00:002013-11-09 16:07:29Raja… you are now part of a happy family!